Why does the Harris Chain water look so ugly? Back in the early seventies when I first started fishing the Harris Chain, Lake County looked much different than it does now. In those days the entire landscape was covered with dark green orange groves and large vegetable farms. I vividly remember Little and Big Lake Harris with orange groves on every hill as far as you could see. It was beautiful, but all that farming pumped huge amounts of fertilizer and pesticides into the lakes for years at a time. The effect was to super inject the Harris Chain with nutrients, particularly phosphorus and nitrogen. These chemicals are not dangerous to humans, but they cause algae blooms. Algae is a microscopic plant. When the sun shines on the water it causes these tiny plants to bloom covering the water like a green blanket a few inches thick. The water under the algae layer is actually pretty clear. Strong winds can also churn up bottom debris adding to the turbidity of the water. Depending upon the time of year, the wind direction and the weather, Harris Chain water color can vary from clear to green to light brown. The Harris Chain is safe for swimming and water skiing, but due to the low visibility and large population of alligators, it is not a popular activity. Harris Chain fish are safe to eat, although we don't eat bass because they are more valuable as a game fish than a dinner. Partly because of these nutrients, the Harris Chain is a highly prolific and diverse fishery. These nutrients create huge schools of bait fish like shad, golden shiners, crappies and pan fish feeding a large population of largemouth bass, birds and other predators. Low visibility positions bass shallower and makes them easier to catch. Adjust your tactics to match the conditions by using noisy lures like Rattle Traps, spinner baits and large plastic worms. 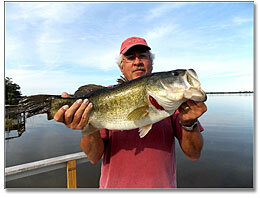 Florida's dark bass waters are much better fisheries than our clear waterski lakes. It may not look pretty to you, but it does to the bass. In fifty years of bass fishing, I know of no better place to consistently catch really big bass. A five pound bass in these lakes is a common occurrence and an eight or nine pound fish is nice, but not all that rare. Many 10 and 11 pound fish are caught each year. In the spring, tournament winning weights regularly exceed 25-30 pounds for a daily 5 fish limit. You will catch small bass too, but trophy fish are what these lakes are known for. The Harris Chain is deeper than most natural Florida lakes and the lack of obvious offshore cover makes Harris Chain bass harder to locate. This means that you must become a better structure fisherman and learn to fish specific spots instead of patterning large visible weed beds. In my younger days, I won a number of South Florida bass tournaments fishing Lake Okeechobee and the Everglades. At the time I thought I was a great bass fisherman. When I moved to Central Florida, I quickly learned that I didn't know anything about Harris Chain bass or how to catch them. Finding and catching bass in 50,000 acres of seemingly featureless water is challenging, but not impossible. Here are some tips that should make things easier. To consistently catch big Harris Chain bass, you must learn the flipping technique. Because of our low water visibility and high fishing pressure, Harris Chain bass have a very small strike zone and won't normally move far to your bait. Flipping solves that problem...learn it...do it! Most of the visible cover in the Harris Chain is Kissimmee Grass. 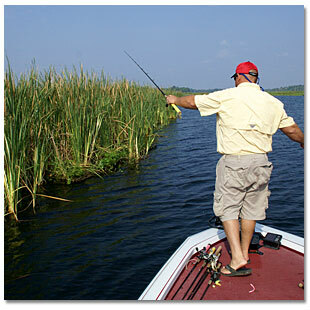 Kissimmee grass grows on hard bottom in one to six feet of water and is prime fish habitat. The best way to fish this cover is by using the flipping technique. Use heavy line, just enough weight to get through the grass and your favorite plastic bait. Two colors work especially well here; June bug and Black/Blue. Flipping works year round, but comes into it's own during the spawning season when the biggest bass of the year are shallow. Monster fish roam this grass and you can expect to be broken off occasionally, even using 25 pound test. 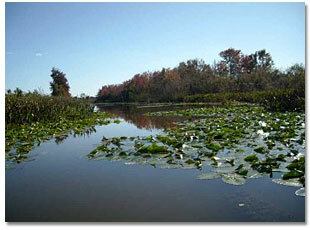 Look for main lakes points, small islands of grass/pads or any area that contains more than one type of cover. 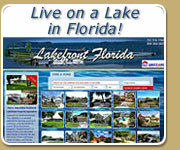 For more information about flipping for Florida bass click here. In the spring, look for bedding bass in canals, creeks and at the back of large flats. Haines Creek, the Dead River, the Leesburg 9th Street lagoon, Helena Run and the Palatlakaha River are prime areas this time of year. Ride around the lakes and look for Kissimmee Grass with reeds, cat tails or pads mixed in. These areas hold fish and are easy to spot. It is possible to selectively fish these spots and come back to the ramp with a consistent limit of fish. Look for isolated pads out in the open or away from the main shoreline. If the pads are next to the opening of a canal, all the better. Use a shallow running crankbait like a Rattle Trap to find eel grass. 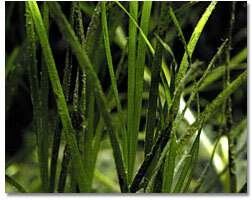 Eel grass is a flat green colored grass that grows in fairly shallow water. It's also the home of lots of bait fish and hungry bass looking for a quick meal. Once you locate this grass, fish the area thoroughly with a worm, Senco or spinnerbait. Since the Harris Chain lakes have cleared in recent years, eel grass is replacing Kissimmee grass as preferred bass habitat. The best place to start is the canals. The numerous Harris Chain canals are full of pads, grass, drop offs and underwater structure. The enclosed area makes fish easier to find and most anglers have less trouble catching these resident fish. Texas rigged plastic worms work year round along with crankbaits, spinnerbaits and top water lures. Generally speaking, the deeper canals have better fishing. However, during the spawning season, January through April, the shallower canals also hold large fish and the water clarity can be right for sight fishing. When fishing a canal, try the center of the canal, not just the shoreline. Most of the anglers will be fishing the docks and sides, driving the fish to the center. Year in and year out, the best all around lure for finding fish on the Chain is a crankbait. This is classic power fishing where the object is to cover as much water as possible. High percentage spots include eel grass beds, pads, drop offs and ridges. Choose your lure to match the water depth and structure conditions. Lipless crankbaits get the nod for shallow conditions and divers running close to cover work in all depths. Use chrome patterns on sunny days and chartreuse or shad colors in low light. Central Florida is a beautiful place to be, especially in the winter months. Huge oaks reflecting on the water sit high on green hills draped in hanging moss. Birds and wildlife of all description go about their lives making a living without visiting Walmart or worrying about their mutual funds. A beautiful spring day on the Harris Chain is one of God's wonderful gifts and should be enjoyed and relished. Fish hard, but keep everything in the right perspective and you will have fun and be a better fisherman in the long run.